Peter Burrill aged 55, his wife Susannah 40, son John 13, daughter Mary 9. Peter Burrill 78, his wife Susannah 64, sister in law, Mary Cundall 57, son John 33, daughter in law Jane 32,	grandsons William John 5, John William 2, Leonard Peter 1. Servants Ann Metcalfe 15, Charles Hayton 12. Daughter Mary 29.
grandson Thomas Clark Whitwham 11. James Whitwham 57 his wife Mary 57, servant Miles Carling 26. Farming 80 acres at Vicar Pasture. Kate Burrill widow 38, daughters Dora 19, Margaret 14, Servant Robert Burton 30.
daughters Jane 29, Emma 27, servant William Waite 19. Q1	It must be shown that the property is no longer chargeable with the Legacies mentioned in John Burrill’s Will of 1759. A1	It may be safely presumed of this remote period that the legacies charged on the Estate by this Will have been discharged long ago. The Vendor is not aware of the existance of any Legacy Receipts. Cannot the legal receipts be produced? 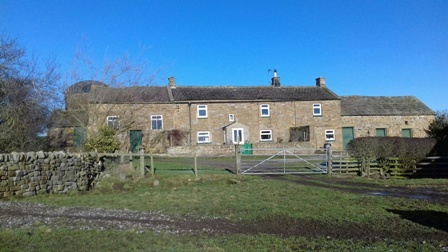 Q2	Some proof of Identity of the property mentioned in the above Will with the property sold must be given. Q3	It must be shown that the person entitled to the life estate and annuity and also that the Legacies are no longer chargeable upon the property which are mentioned in the Will of Leonard Burrill of October 1805. Q5	Was Rye Wood Close devised to Leonard Burrill by the Will of 1759? A5	Rye Close was devised to John Burrill and the wood growing and to grow thereon was given to Leonard. It is now the absolute property of the Vendor. See further requisition No. 3. 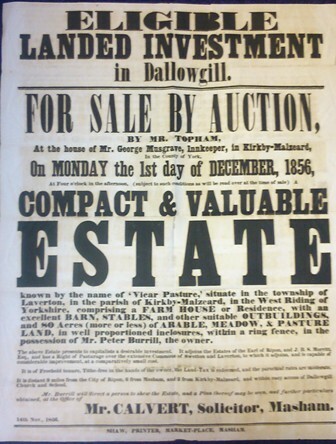 Q6	It must be shewn that the property is no longer chargeable with the annurity and debts and legacies mentioned in the Will of John Burrill of June 1820. Q7	Are the Grantees mentioned in the Indenture of August 1856, Trustees? A7	It does not appear from the Deed that they are Trustees. Q8	By the 4th Condition of Sale the Vendor agrees to deliver an Abstract and deduce a clear Title to the Inheritance in fee simple thereof free from incumbrances. It appears by the abstract that the property is subject to two separate and distinct Mortgages (which at present are Incumbrances). How does the Vendor propose to get in these Incumbrances? A8	The mortgages will be paid off out of the purchase money and the mortgage will release in the usual way in the Conveyance to the purchaser. Q9	Are there any Judgements etc registered against the property? A9	I am not aware of any. Q10	Is the Vendor married? If so when did the marriage take place? Q1	The Declaration should show that the Vendor is the Son of John Burrill the Testator of 1820 who was possessed of the property, now sold and that he took same as devised of Leonard Burrill his Father who was the Son of John Burrill the Testator of 1759. This can be done by some old person acquainted with the Family and who has heard his ancestors talk about it. Q2	The Requisition applies to Legacies independant to those left to Elizabeth Burrill afterwards Peacock. The Deed Poll only applies to her legacies and is only executed by her and her Husband. A2	The only other Legacy is one of £20 to the present vendor. Q3	The Abstract does not shew that Rye Close Wood is the absolute property of the Vendor, this must be supplied. A4	The Vendor cannot answer this Query. They are Mortgagees and will join in the Conveyance. Q5	It will materially increase the Cost of the purchasers Conveyance making the Mortgagees parties; but we have no objection whatever to the proposed plan but the Vendor must make the Vendee some allowance for the extra cost and as the Wife of the Vendor appears to be entitled to Dower she will also be a necessary party and will have to join in and acknowledge the Deed and this cost must also be borne by the Vendor in accordance with the 4th Condition of Sale. Q5	Two mortgages on an estate are not unusual, and the length of the Conveyance will not be increased whereby the Vendor can be called upon to contribute to the expense of it. The Wife of the Vendor will join in the Conveyance, and the Vendor will have the Deed acknowledged by her at his own expense. If you have anything that is associated with Dallowgill in any way, we would love to see it, as everything, however small and seemingly insignificant, helps towards the bigger picture.